Clearly based off my current posts, you can tell I am obsessed with light pink/blush. This is the color I find myself gravitating towards when shopping for my Spring and Summer wardrobe. This is the perfect on-the-go top that would look perfect with a pair of jeans or shorts! 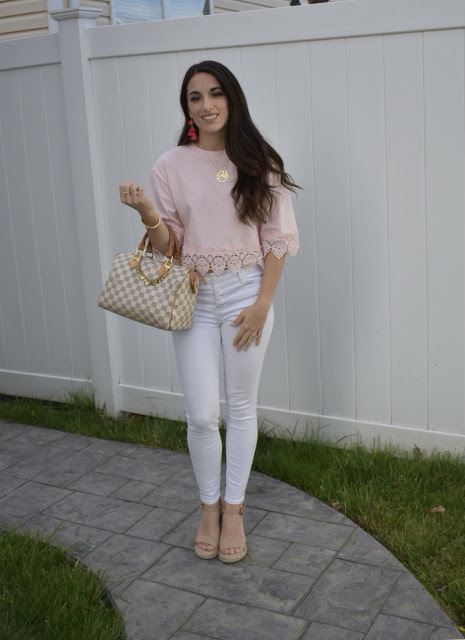 This top is super comfortable and easy to just throw on and go. It is cropped so if you don't want to show any skin I would pair this with high waisted pants or shorts. This also came in a really cute blue and white striped pattern that I was torn between as well. The best part is that its only 35$! I know its going to become one of my go-to items for Summer! What are some of your go-to items in your closet? Can never go wrong with Denim!! !